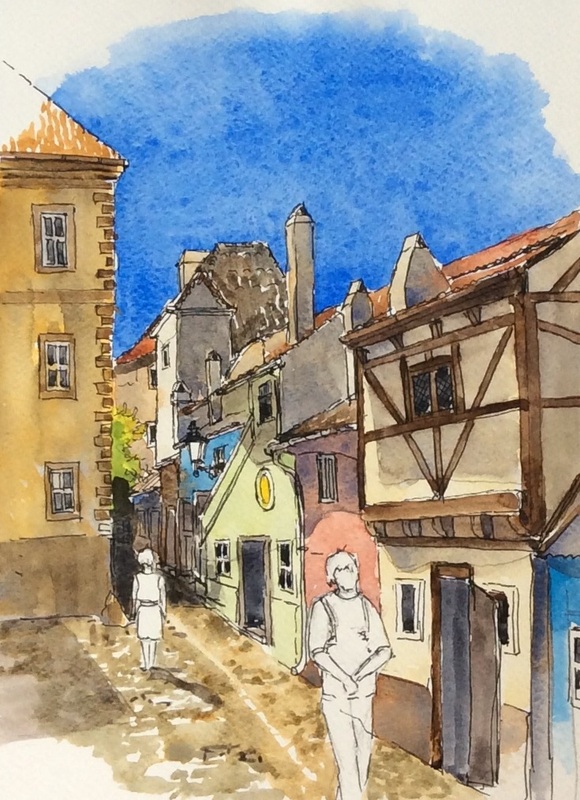 As promised here is the pen and ink work I started in the Golden Lane in Prague castle on Friday. Yesterday was pretty nice but by the time it was over we were pretty fed up with the hoards of tourists. Walking in the popular districts is like driving a dodgem car, it’s effectively impossible to walk briskly or to avoid being bumped. We decided to take a short cruise on the Vlatava, the river which runs through Prague, there are lots of boat trips on offer but it was pleasant to be on the water in a breeze because it was threatening to become very hot. After our cruise we walked across the river and into the small canal area they call (rather tongue in cheek I suspect) Prague Venice. Under one of the arches of Charles Bridge we came across a couple of buskers with a big crowd so we sat for half an hour or so listening to them. Really good buskers seem common here, the other night we listened to a brilliant four piece group playing jazz standards, and today in Kutna Hora we came across some sort of music festival with two brass bands and a group of girls doing a traditional dance with flags. Back to yesterday leaving the buskers we wandered into a park and quickly turned back as a thunderstorm started. A rush to a local restaurant ensued, and a salad and beer enabled us to stay under a veranda out of the rain. I managed several sketches including one done standing amongst the hordes on Charles Bridge. 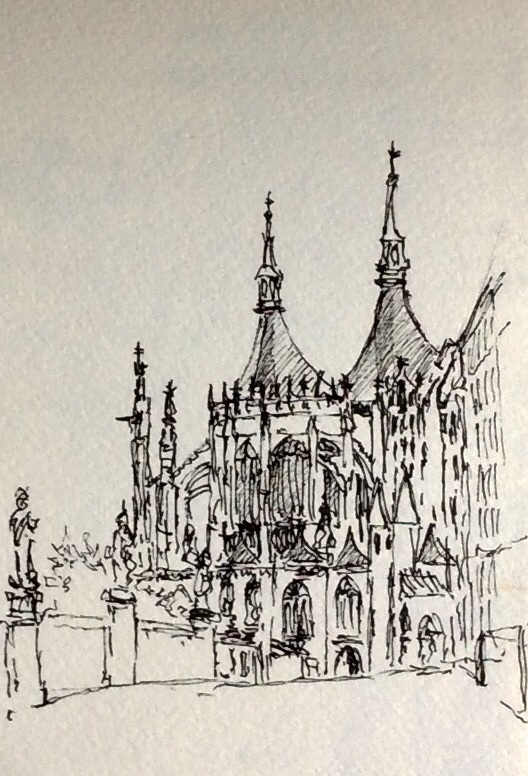 This morning a 70 km drive quickly got us to Kutna Hora, east of Prague, this town was wealthy in medieval times from silver mining, consequently it has some spectacular buildings, notably St Barbara’s Cathedral which I sketched while we were enjoying a pizza lunch. Later we went on a guided tour of a 16th century silver mine. We were all dressed up in traditional, white mining jackets with hoods a wore helmets with lights. The tunnels were about 50 metres below the surface and were narrow and, in places, only about 1.2 metres high. Interestingly they are so old that in wet places they have lime formations building up on them. Neat; I like the sketches. A silver mine would be interesting – I’ve only done salt mines!